The summer of 2019 marks the end of the Mahōka Kōkō no Rettōsei: Raihōsha-hen (The Irregular at Magic High School: Visitor Arc) manga as the fifth volume of the series announces its end with its sixth and seventh volumes. 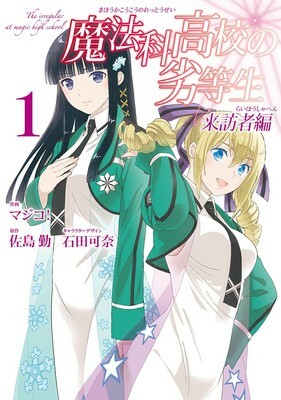 “Mahōka Kōkō no Rettōsei: Raihōsha-hen” is an adaptation of 9th to 11th volumes of the original “The Irregular at Magic High School” light novel series. The manga was launched in Square Enix’s G Fantasy in December 2015. As stated, “The Irregular at Magic High School” is a light novel series that was created by Tsutomu Satō. The series was published on Shōsetsuka ni Narō, an internet web novel website starting in October 2008. It ran for a total of 6 volumes before it reached its end in March 2011. When Satō reached a deal with Dengeki Bunko, his work gained a light novel format beginning July 2011. By 2013, there were manga adaptations for each arc of the series with varying manga artists and publishers having worked on them. The anime adaptation of the manga series was released in April 2014 by Madhouse and ran until September 2014. The series had a total of 26 episodes and was directed by Manabu Ono, who previously worked on the key animation of “Neon Genesis Evangelion.” As for other staff, there were three writers and four producers who worked on the series. The story of the series sets in a world where magic exists and with an alternate history was polished through modern technology. The star of this tale is the coolheaded Tatsuya Shiba. He is the bodyguard to his sister Miyuki Shiba who is also a candidate to succeed the leadership of the Yotsuba clan, one of the Ten Master Clans that govern Japan’s magicians. The two have just entered into First High School, a school segregates its students based on their magical abilities and both have rather contrasting reputations. While Miyuki is a first-course student and is viewed as one of the best students, Tatsuya is regarded as the complete opposite having been placed in the second course. However, with his unique magical techniques and combat abilities, Tatsuya begins to prove more than he seems.